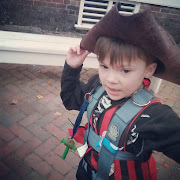 This review and giveaway was made possible by Double Duty Divas and Pampers. I was compensated for my participation in this campaign, but all opinions are 100% mine. Don't forget to RSVP for Todays Twitter Party too!! While you are waiting on tonights twitter party, scroll below to Enter my Blogs Pampers Easy Up's Giveaway. We both are learning, and I love how easy Pampers Easy Up's make it for first time Moms like myself. It really is a Potty Learning Experience for the both of us. Pampers has a guide when to start potty training based on the Childs readiness. Check out the Potty Training Tips by clicking here. I like to use a Potty Training Chart. 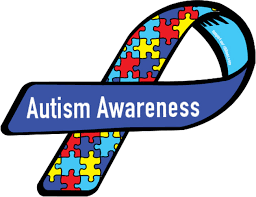 My son is visual, doesn't talk, so pictures, and routine matter a lot to him. 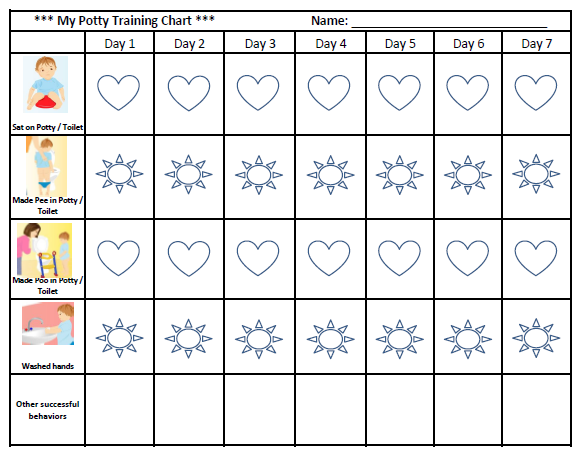 Right click, and Save As on this Free Potty Training Chart if it's something fun you want to use too. Don't forget to Enter My Blogs Pampers Easy Ups Giveaway!! 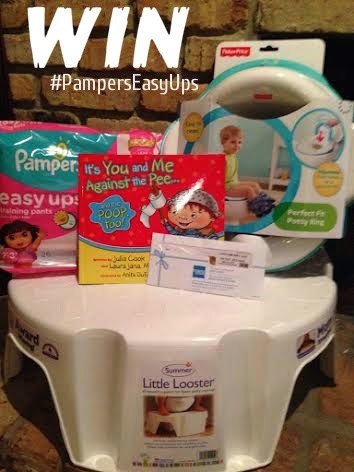 We are giving away A Pampers Easy Up's Prize Pack. U.S. Residents Only. Giveaway begins 4/20/15 12:00AM, and Ends, 4/ 28/15 12:00AM. ONE WINNER; A pack of Pampers Easy Up's, a Little Looster Step Stool, a Potty Ring, a "It's You and Me against the Pee... and Poop too!" book and a $50 AMEX gift card. 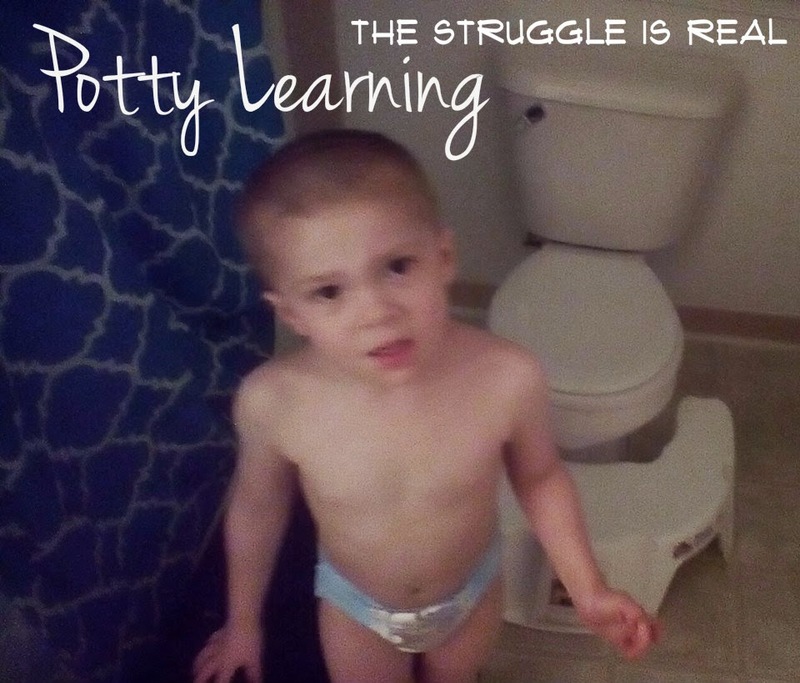 Don't worry if you don't win my Giveaway, We all know that the Potty Learning struggle is real. There is going to be a Pampers Twitter party April 21st from 9-10PM EST. Go now to RSVP to Pampers Easy Up's Twitter Party! Come join the fun, and joys of parenthood. I have found using a rewards system has worked well. We are about to start potty training my grandson. I'm not potty training right now but I will be again in the future since I'm expecting a baby. What worked for my son was using Cheerios as targets. I just got done potty training and it really helped to have my older daughter serve as a role model for potty training for my younger daughter. What worked for my oldest grandson was using M&Ms and stickers as rewards for a successful potty trip. It kept him motivated! Potty training my 3 year old now. He LOVES rewards, especially candy. I have to praise him consistently. I am not potty training right now, but my sister is. When I started my daughter potty training, I used a mini-Elmo potty seat, which we kept in the living room, since she spent the most time there. I gradually moved it closer and closer to the bathroom, and eventually we worked our way up to a Dora seat that went right on top of the toilet. This really helped me be successful with her potty training! 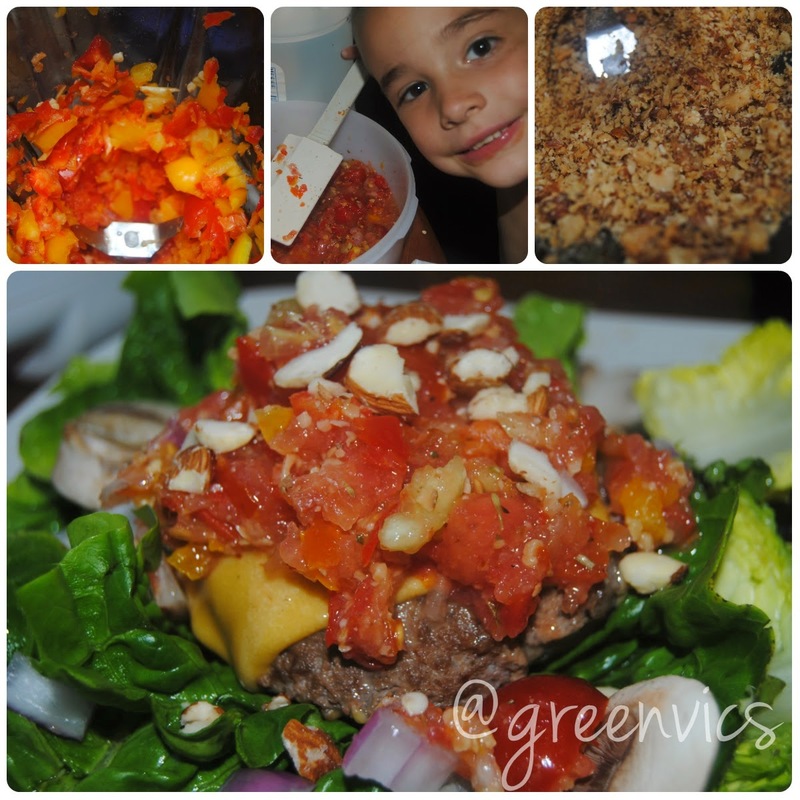 My tip is to have patience and to make the whole experience fun and inviting for the child. I am trying to potty train my youngest son and its not going as well as it could. A reward chart seems to help along with constant reminders. I am not training right now but have before. My tip is create songs to sing while on the potty and be very encouraging. What works for us is we use a rewards system and we keep track of there progress by using a chart. Keeps them motivated and keeps it fun. we put her naked or just in her underwear and made a big deal of her big girl underwear and checked a lot and asked if she needed to go the bathroom, we still had some accidents but overall it was still good.we put her naked or just in her underwear and made a big deal of her big girl underwear and checked a lot and asked if she needed to go the bathroom, we still had some accidents but overall it was still good. Nope not potty training.. I would think encouragement and a reward system would work best. We put a basket of books right next to the potty chair. When trying to get him to sit on the potty....he always looked forward to me reading stories to him. He loved to sit on it! I am potty training my 3 year old right now. My advice is to let them train when they are ready! I tried with my daughter over a year and ago and she literally has refused until now! We will be potty training in about 2 months. With the older kids we used hugs and kisses, on good or bad days. what a cute prize....my son is potty training now I would love this! We're all done with potty training. What worked well for us was praising the successes and overlooking the oopsl. I am not currently potty training, but will be helping my sister in law soon. We made it a game and used small rewards. My kids really liked that. Me me me,(Becky Miller0 i really would love to win this one. I use a doll to show my kids how to use the potty. My little girl is mostly potty trained. She still wears a pull up at bedtime. We are just about ready to start with my little man. Silly books about going potty seemed to help my daughter get over her fears. I am not currently potty training but what did work for me was a reward system and lots of high fives and hugs. No I am not potty training right now. One of my favorite tricks was to sit her on the potty every morning. Sun shades are often HKNPL machine high end brands, BBC made a really picture: the product profit is a biggest clothing or purses, but wallet, clip, scarves, umbrellas, sunglasses and seat belt these gadgets. A few years previously read a report, there are individuals wearing H&M and Body of water Island Sunglasses visually disadvantaged, but also to buy cheap things to find a good reason. Luca Solca also pointed out that in the high end consumption, 6% of consumers usually are loyal customers, what they obtain what brand; on the other hand Sun shades belonging to the luxury of starting, only lower prices, so it purchased a limited budget guest. in 60s will be able to make the leopard print out can also be consumed by civilians. Today, Dior is depending on these three sunglasses, but additionally continue to hold up half the actual sky. Dior So actual was first released in 2014, from the beginning to give a show to each of the guests began to talk to the Rihanna, it has become an excellent popular over the years. The glasses in the middle of the junction from the disintegration, instead of using a sleek line in the framework from the convergence of two lens, both the construction of the collection and in line with the nature of brand customization. The use of artificial resin with black metallic details of the decoration, the entire delicate light. Boys wear this is no problem. So Actual popular continues, this year's autumn and winter is still eye-catching. Dior another hot is Divided, this one is the best benefit is actually large enough to cover the face of your semi face can also be subjected to the sun who is also very stinky smell, hide acquaintance spy tools.